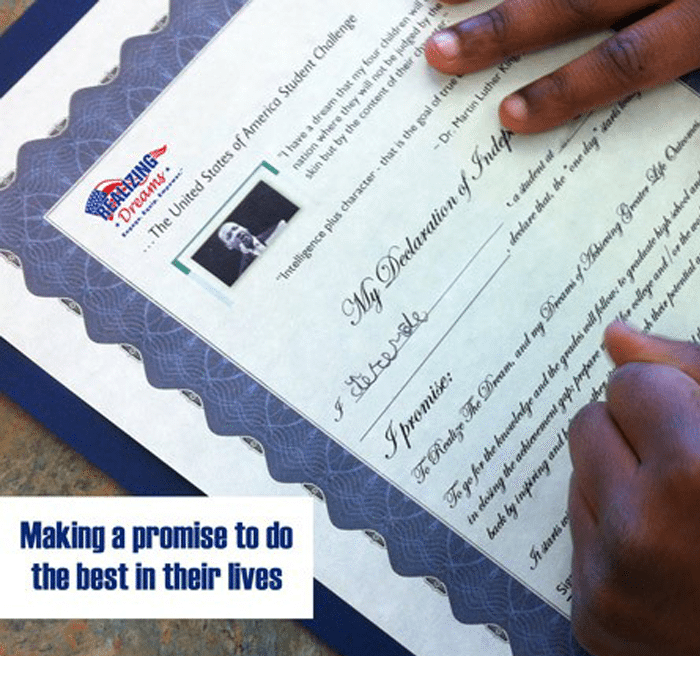 Invite students to make a promise to do the best in their life. 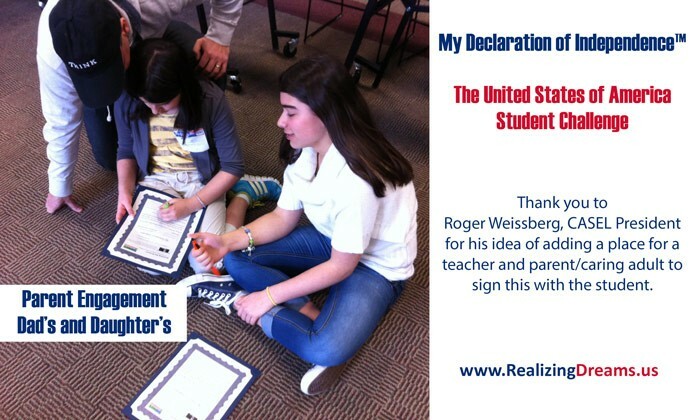 Take initiative, accept the invitation to sign The United States of America Student Challenge. Invite students to make a promise to do the best in their life. 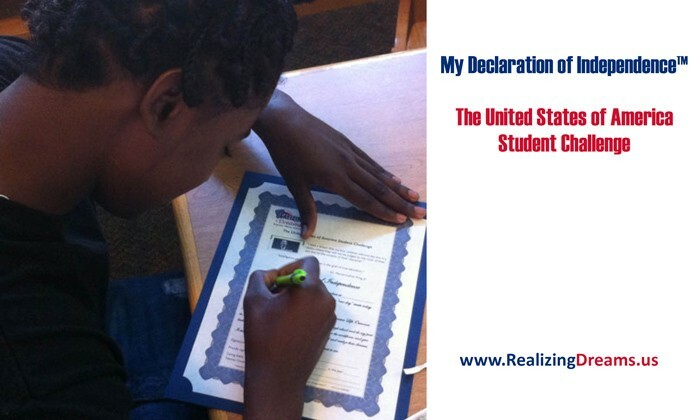 Take initiative, accept the invitation to sign The United States of America Student Challenge and sign your My Declaration of Independence™. Recommended for grades k-12. Younger students may need someone to help read the text. Growth Mindset Activity: Invite students to read the My Declaration of Independence™. When they accept The United States of America Student Challenge, they take initiative by making a promise to do the best in their lives. After reading it, Realizing Dreams has found that students usually eagerly say, Can I sign this? When asked what did he sign and how he felt, William F. Jr., a 5th grade student in an inner city school said, “I feel really, really happy joyful and relieved.” Jim Cantoni, Realizing Dreams Founder asked, Why relieved? William said, “Because I always wanted to sign something that was pretty important. My first time signing something like the My Declaration of Independence, I feel very relieved that I have done that.” It is positively empowering! Consider getting a Positive Pen™ for each student to sign it with and you will also create the “positive affect”. 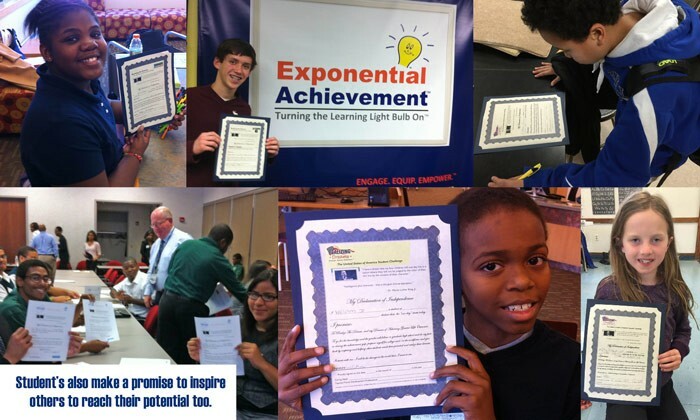 Ideas for applications: Growth Mindset, Personal Best, celebration and activities for Dr. Martin Luther King, Jr Day in January and just to inspire students to reach their potential, inspire other students and be the change in the world they want to see. Size 9.5″w x 12h”. Only $4.95 each. Comes in packages of 10.